To celebrate Tate Modern’s 10th anniversary, the gallery will host No Soul For Sale – A Festival of Independents. For this free arts festival, Tate Modern is inviting over 70 of the world’s most innovative independent art spaces, not-for-profit organisations and artists’ collectives, from Shanghai to Rio de Janeiro, to take over the Turbine Hall. The festival will fill the iconic Turbine Hall space with an eclectic mix of cutting-edge arts events, performances, music and film on 14-16 May 2010. The gallery will stay open until midnight on Friday 14 and Saturday 15 May for late night events. 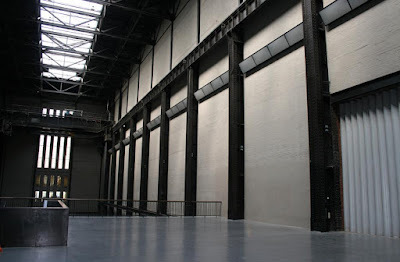 Tate Modern first opened on 12 May 2000 and over 45 million visitors have passed through the gallery’s doors since. Scrawl Collective artists' Phil Ashcroft, Will Barras and Cat Johnston have been invited to participate in No Soul For Sale. Over the course of the weekend, the artists will be taking part in a live-painting collaboration across a six-metre wall on Tate Modern's Turbine Hall Bridge. More info on the festival over on the No Soul For Sale website.